NEW YORK, December 16, 2010 - As Ramen fever spreads throughout the United States, the ramen fan base is rapidly increasing. Ramen shops have popped up everywhere, with each shop boasting its own unique take on this classic Japanese noodle dish. With the wealth of new ramen options, connoisseurs have begun to wonder where the true soul of ramen lies, and which of the new ramen shops is the most authentic. A panel of ramen experts answered these questions at Asia Society, including Adina Steiman, food editor at Men's Health Magazine, who began by examining the universal appeal of ramen and its adaptability. Invented in 1958 by Momofuku Ando, instant ramen is now an international comfort food. Even in Japan, there are endless permutations of ramen. Rickmond Wong, proprietor of Rameniac.com, treated the audience to a slideshow ramen tour of Japan, from the Sapporo Ramen Alley to the Yokohama ramen museum. Some of the newest innovations include green curry ramen, a Thai-inspired dish, and Iberian ham ramen. The audience was given a glimpse into the story of one ramen shop's transnational journey to New York from Shigeto Kamada, owner of Minca Ramen Factory and Kambi Ramen House. 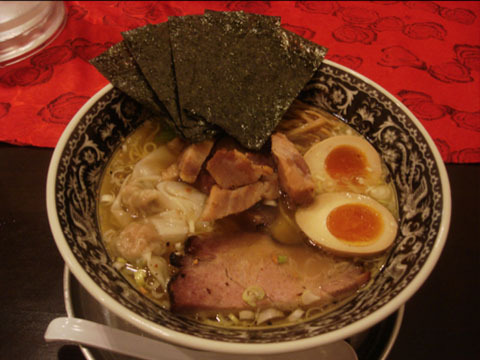 Kamada explained that, as a Japanese expatriate, he craved the Kumamoto ramen noodles that he had enjoyed at home and on his Japanese tour with his jazz band, so he decided to bring his favorite ramen to New York. His quest for the perfect ramen also led him to alter his first recipe to suit New Yorkers' diverse taste buds; as a result, the Kambi Ramen House menu even includes a kimchi ramen option as well as a vegetarian version. A clear conclusion of the talk was that innovation and experimentation only continue to fuel ramen fever in New York and throughout the world, ensuring that this adaptable dish will remain exciting and unpredictable far into the 21st century. Following the panel, Shigeto Kamada treated guests to a Ramen demonstration and tasting.